George Graham Reviews Guy Clark's "Workbench Songs"
With the roots rock scene continuing to attract audiences, the role of Texas-style singer-songwriters in the genre is getting increased recognition. And a gentleman who is the epitome of the style, even though he has not been living in Texas for 30 years, is Guy Clark, who has just released his tenth studio album called Workbench Songs. Probably better known as a songwriter than a performer, Clark has created compositions that have been covered by some major figures in roots rock and country music, including Jerry Jeff Walker, who hat a hit with one of Clark's early compositions, Desperados Waiting for a Train, as well as Johnny Cash, Ricky Skaggs, David Allen Coe, Vince Gill, George Strait, Rodney Crowell and Lyle Lovett, to name a few. Clark was born and grew up in the West Texas town of Monahans. With his father in the Army and his mother working, he spent a lot of time with his grandmother, who ran the local hotel, where he met an interesting collection of characters, some of whom served as the inspiration for his songs. Later, he moved to Houston, where he met legendary Texas songwriter Townes Van Zandt, with whom he had a deep and lasting friendship. Clark and Van Zandt often toured together until Van Zandt's death in 1997. Clark moved about, spending some time San Francisco in the psychedelic days of the late 1960s, then moving to Los Angeles, and finally to Nashville in 1971, where he has been based ever since. After Jerry Jeff Walker had a hit with Desperados Waiting for a Train, Clark did his own debut album in 1975, and has been recording somewhat infrequently ever since, with an extended hiatus in the mid 1980s. Since 1988, he has been recording almost exclusively in an acoustic setting, usually in a small group, providing an intimate setting for Clark's pithy gems of lyrical observation, wit and insight. His latest recording, Workbench Songs is no exception, though he is now on a new record label. Though Clark has generally been known a solitary songwriter, Workbench Songs continues a modus operandi started on his last album The Dark, released four years ago in 2002 -- all the original songs are joint compositions with a variety of different collaborators, including some other folks who have made their mark in Nashville as songwriters, including Lee Roy Parnell, Darrell Scott, Rodney Crowell and Gary Nicholson. He also writes a couple of songs with his long-time instrumental collaborator, Verlon Thompson. And he also covers two songs, one by Townes Van Zandt and one a traditional tune. Clark commented on why he has been co-writing songs -- he says it helps in the editing. When he works with someone else, he has to sing the song out loud, rather than just keeping it to himself. The process of working with someone else he says helps him to weed out the bad ideas quickly. Notably absent from performing on this CD, though he did co-write a song with Clark is Darrell Scott, with whom Clark made several albums. Scott always added a lot of nice touches, and he is also a gifted producer. Scott is currently working on his own music and working with his father Wayne Scott. But the group on Clark's new CD is a fine one. In addition to Verlon Thompson, regulars include Byrn Bright on bass, Eddie Bayers on drums and percussion, as well as Chris Latham on violin and other instruments, along with serving as engineer and co-producer with Clark and Thompson. 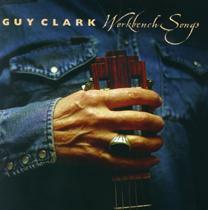 The artwork in the CD booklet for Workbench Songs, shows Clark's neat and well-equipped woodworking bench, where he has built instruments and among other things. He is pictured with a guitar he made there, which presumably is used on the CD. It's the tenth guitar he has built, to go with this tenth studio CD. Both show a lot of craftsmanship. Clark is never one to rush the making of an album or the writing of songs, so virtually every song is a gem, carefully honed and crafted to make every note and word count. It's fully up to Clark's high standards, and like his past efforts, he makes it sound deceptively informal and spontaneous. But they are the kind of songs that remind us of why Guy Clark is held in such high esteem by his peers. Our grade for sound quality is an unequivocal "A." The sound is clean, intimate, warm and notably free of volume compression, which is a considerable rarity these days. Chris Latham handled the technical duties, including the CD mastering. The one slight lapse is the home recording on the last track, which was obviously done on modest equipment, and sounds it. In the roots rock, Texas singer-songwriter genre, Guy Clark is about as good as it gets. And his new CD only confirms that.